The Cincinnati Reds invite our fans to share condolences here as we mourn the passing of Hall of Fame manager Sparky Anderson. Please leave your thoughts in comments. The Cincinnati Reds mourn the passing of the great Sparky Anderson, manager of the National League’s last repeat champions in 1975-76. “Every day here we are reminded of his contribution to the success of this proud franchise,” Reds President and CEO Bob Castellini said. 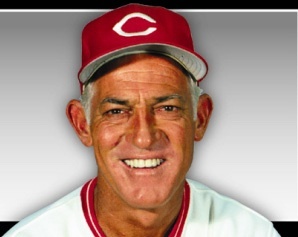 There was only one Sparky Anderson, and when you think of the Big Red Machine, you have to think of him. Sparky managed the Reds from 1970-78, and then went on to also win with Detroit in 1984 and become the first manager ever to manage a World Series champion in both leagues. He spent 42 years in professional baseball, 26 as a manager, and is immortalized in Cooperstown with a Reds cap. He is beloved by Reds fans and the club invites all fans to share your condolences and memories in comments here. At the request of Mr. Anderson, there will be no funeral nor memorial service. The family also requests any donations be made to CATCH, Sparky’s charity for children in Detroit, or the charity of one’s choice. Donations to CATCH may be made online at www.catchcharity.org. I began following baseball in the late 1960s, but fell in love with the game during the era of The Big Red Machine. Of course, that period would not have been the same without George Lee “Sparky” Anderson. Growing up in Louisville, it was natural for me to adopt the Cincinnati Reds as my favorite team owing to their geographic proximity. And what a treat that turned out to be, following that team just as the combination of outstanding players and Sparky’s skilled management began to direct it to previously unimagined heights. As a youth, I was incapable of appreciating how difficult a job it is for a baseball manager to massage a group of 25 athletically gifted individuals with strong wills and large egos into a team. And Sparky was so good at it that he did it for two franchises. That’s an indicator of true greatness. The history of baseball is filled with larger than life characters, and those of us who follow it have been enriched by their contributions. I’m honored to have been a fan of major league baseball during Sparky Anderson’s time in it, and I’d like to thank him posthumously for what he did to secure my lifelong love of the game. Echoing all of Mr Swinney’s comments, I grew up in a small town north of Cincinnati in a family of Reds fans for generations – and we all remain so today. We listened to or watched every Reds game – and made the big trip down to Riverfront for 1 or 2 games each season. During the ‘Big Red Machine’ era, I remember listening to first Al Michaels and then later Marty B interview Sparky before each game on ‘The Main Spark’ radio pre-game show. Later I heard Sparky teamed with the likes of fellow HoFers Jack Buck and Vin Scully as a post-season national radio color commentator for several years – a real treat. I’ve lived on the west coast now for 15 years but still get back to Ohio for a couple Reds games each season. Back in 2005 I was just lucky to pick the weekend the Reds retired Sparky’s #10 at GABP – with Sparky and several ’70s era Reds team members in attendance… probably Sparky’s last trip into Cincinnati. It’s sad to realize now Sparky won’t be around to see (and comment at length…) on the rise of this new Reds team. How appropriate it would be for the Reds to win it all next year in a season dedicated to the memory of and legacy left by Sparky Anderson! One of my biggest thrills as an 13 year-old boy was meeting and getting the autograph of Sparky Anderson, at a pre-spring training exhibition baseball game at Blair Field in Long Beach California, in which Mr. Anderson was managing a team of MLB “All-Stars” (most of whom lived played for the Dodgers, Angels, and other teams who lived in the SoCal area). Sparky was just about to begin his tenure as the Reds manager in the 1970 season and NOBODY had ever heard of him. It wasn’t long before EVERYONE did! I loved the Reds in those years and the more I saw of who he was as a person as well as a baseball man, the more I grew to admire Sparky Anderson. Baseball has lost a great member of its family tonight, and I feel as if I’ve lost a friend. Rest in peace, Sparky. I have never had the chance to meet Sparky, but what I’ve read about him already sounds like he would have been a “GREAT ONE” to meet. When I was fifteen years old during the Big Red Machine time, I couldn’t wait to get my school work done so I could listen to the Reds baseball games and most of the time I remembered more about baseball than I could care less about school. Lately, I’ve been going through a lot of the newspaper clippings as well as the team picture of 1975 at my late parent’s house and i’m going to keep them for a long time. Oh the memories that will never leave my mind because of Sparky being such a good manager and thought a lot of his players. I’m sure for many weeks to come as well as when the 2011 baseball season starts, everyone that Sparky has been a part of their lives will keep him in their thoughts while playing ball. Joe Nuxhall can once again mention Sparky’s name up in the baseball of heaven’s angels when Sparky will have a team he will be putting together that probably won’t be playing just for six months but forever. GO REDS and let’s win the World Series for the ol “Sparky”. I am a lifelong Reds fan dating back to 1972. So, when I was a kid I was mesmerized by Sparky’s white hair. So much so, I wanted to grow-up and have white hair like him. When I visited my grandfather in Colorado (who I had only seen once before and barely remembered) I was ecstatic as a 12 year old to see my own grandfather had snow white hair like Sparky! I am 45 now with black hair. However, the gray hair is starting to appear and perhaps the “Sparky hair” is right behind (however, it can wait). Bottom line, tears flowed when I heard the news of his passing. I met him once years ago in Detroit and he was just like Johnny Bench was quoted as saying “If he didn’t have a smile, he was probably asleep.” He had that smile and was very gracious as he signed a baseball. After learning of his passing, a piece of my childhood was lost today. Very sad. Although growing up in California a Dodger fan, I watched in amazement how Sparky managed and lead his BIG RED MACHINE. An incredible collection of talent, yes, but they won championships because they were a team. Sparky knew that was the key – the team was everything and that game of baseball was bigger than any single player. Sparky will be missed. Sad day indeed. What can I say? I grew up in Southern Indiana, and as a kid, had WLW on the radio, as well as watching the Reds with my Step Dad. When we played baseball as kids, he taught us to play like the Big Red Machine. He taught us about not only Morgan, Bench, Rose and Perez, but about the only manager whose name I knew at such a young age. MR SPARKY ANDERSON. He was never afraid to tell the players what he thought, nor was my Step Dad. I look back on fond memories of learning how to play baseball, which I teach my son; to do his best, the way Sparky told his players. I teach him to hustle like Rose. I guess what I want to say is that I learned a lot from those Reds teams of the 70’s, and Sparky will be missed. Rest in peace, skip. Thank you for teaching me and my son how to play baseball. Once a Red, always a Red. As a teenager growing up in West Virginia and following the Reds every game on the radio I never thought I’d ever get to meet Sparky Anderson but in August 1978 I did. Myself and 2 friends were in Cincinnati to see 2 games against the San Diego Padres and we decided to head off to the Reds 580 Gift shop on 5th and Walnut hours before the Reds played and while we were shopping in walked Sparky! Had no clue that we going to be there to sign and there was only a few people in the shop. We all got an autograph and had a few minutes to chat but most of all he was extremely nice to everyone. 32 yrs later somewhere along the line I lost my autograph but never forgot the day I met Sparky Anderson. There will never be anyone like him and I’m so glad I was old enough to enjoy the 70’s Reds team lead by Sparky Anderson… God bless you Sparky… you will be sadly missed…. THANKS FOR THE MEMORIES,SPARKY!! AS A 6 YEAR OLD BOY GROWING UP IN LEXINGTON,KENTUCKY,YOU AND THE REDS WERE MY FIRST REAL MEMORIES OF MY CHILDHOOD. MY FATHER AND I USED TO GATHER AROUND THE RADIO JUST TO HEAR ABOUT OUR HEROES:YOURSELF AND ALL THE OTHER GUYS ON THE BIG RED MACHINE. THANK YOU,THANK YOU,THANK YOU!! BASEBALL HAS A HUGE VOID TODAY,AS WELL AS ALL OF US REDS FANS. YOU WILL BE SORELY MISSED!! GODSPEED,MR. ANDERSON!! HOPE YOU’LL SHAKE MY HAND ON THE OTHER SIDE!! I never actually got to see Sparky doing his thing but my dad raves of the impact he had on the game. My dad was a Twins fan. Either way, the stats don’t lie. I was 10 years old when Sparky became the Manager of the Reds. What a pleasure it was to watch him work. He was and will always hold a special place in the hearts of all Reds fans. Thank you for the memories, God Bless You and Rest in Peace.